The Louis A. Simpson and Kimberly K. Querrey Biomedical Research Center will formally open to campus in mid-June. View a tour of the Louis A. Simpson and Kimberly K. Querrey Biomedical Research Center on Instagram. 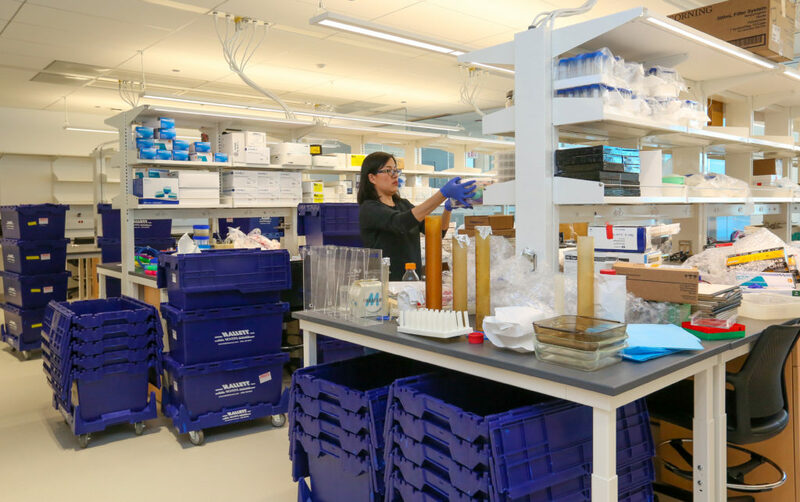 The first laboratories at Northwestern University Feinberg School of Medicine began moving into the new Louis A. Simpson and Kimberly K. Querrey Biomedical Research Center on April 15, marking a significant milestone in the expansion of the medical school’s research enterprise. The Simpson Querrey Biomedical Research Center, which will be connected floor-by-floor to the Robert H. Lurie Medical Research Center, is uniquely designed to foster strong scientific collaboration and interdisciplinary interaction. These early moves begin the initial occupancy phase of the building, ahead of the official opening in June. The initial phase of Simpson Querrey Biomedical Research Center occupancy began April 15 with investigators in the Feinberg Cardiovascular and Renal Research Institute, and will be followed by the Center for Genetic Medicine. The Department of Biochemistry and Molecular Genetics will move into the building in early May, immediately followed by laboratories in the Division of Pulmonary and Critical Care. Each move is complex, and it can take weeks to move large amounts of sensitive scientific equipment. The first laboratories began moving into the Simpson Querrey Biomedical Research Center on April 15. In June, the Stanley Manne Children’s Research Institute at the Ann & Robert H. Lurie Children’s Hospital of Chicago will begin moving into three of its four laboratory floors, as it relocates its entire research enterprise from its Lincoln Park facilities to the Simpson Querrey Biomedical Research Center. 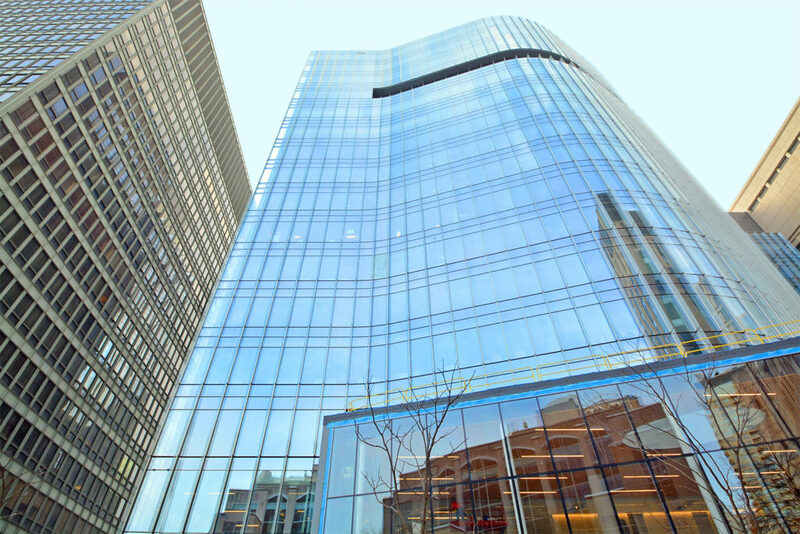 The Stanley Manne Children’s Research Institute will occupy four floors of the new building, allowing investigators in pediatrics to share the same research space as Northwestern scientists across disciplines for the first time. Feinberg research groups will occupy another four floors of the building, with a ninth research floor dedicated to cross-campus Northwestern University research programs. This fall, three cross-campus programs will move onto the 11th floor, including Northwestern’s Simpson Querrey Institute for BioNanotechnology, Center for Synthetic Biology and Biomedical Engineering. At full capacity, the first phase of the building will house 23 research groups per floor, with 200 principal investigators in total. “The building will allow us to increase our footprint in discovery and recruit more top investigators into what’s going to be some of the best state-of-the-art research space in the country,” said Rex Chisholm, PhD, vice dean for Scientific Affairs and Graduate Education. During the occupancy phase, construction will be ongoing on several floors, as well as the public spaces. However, new campus amenities will be opened in phases this spring and summer. A skybridge on the second floor of the Simpson Querrey Biomedical Research Center, slated to open in mid-May, will connect to the Searle Building, enabling further connectivity across campus. “With the new bridge, we’ll have connection across almost all of campus. You’ll be able to go from the Ward building to as far as the Arkes Pavilion, Lavin Pavilion, or Lurie Children’s Hospital without ever going outside,” said Eric Boberg, PhD, executive director for research. In mid-June, a new Starbucks location will also be opening on the first floor of the Galter Health Sciences Library & Learning Center, in the southeast corner of the Searle Building. The coffee shop will be directly connected to the Simpson Querrey Biomedical Research Center via the skybridge. The Simpson Querrey Biomedical Research Center will feature new public spaces, such as the Potocsnak Family Atrium, a 160-seat Simpson Querrey Auditorium, the Judd A. and Marjorie Weinberg Gallery, the Kabiller Student Commons and the Senyei Conference Center with five conference rooms on the mezzanine level. Opening later, dining options will be located in the new building as well, and there will be a new designated shuttle shelter for pick-up and drop-off with Northwestern’s train station shuttle service. “While the Simpson Querrey Biomedical Research Center will significantly expand our laboratory space, the building will also serve as a vital new resource for all of our faculty, staff and students, offering important new amenities, meeting spaces and overall creating a more cohesive campus environment,” said Heather Campbell, vice dean for finance and administration. The building, which was designed by Perkins+Will, will formally open to campus in mid-June. It is on track to be LEED Gold Certified, signifying a strong commitment to sustainability and energy efficiency.